One of the best parts of having a January birthday s getting a first look at the birthday gifts from two of my favorite beauty retailers, Sephora and Ulta. So today, I'm going to show you what goodies you can expect on your big day this year. While both birthday gifts are pretty nice -- who does not like a present? -- they are distinctly different. Sephora has a fairly premium brand available this year, while Ulta is offering first-access to a new product from Calvin Klein. If you are celebrating a birthday this month as well, we'd love to know what you thought of your goodies. Share your thoughts with us in the comments, on Facebook or join the conversation on Twitter! COST: FREE during your birthday month. 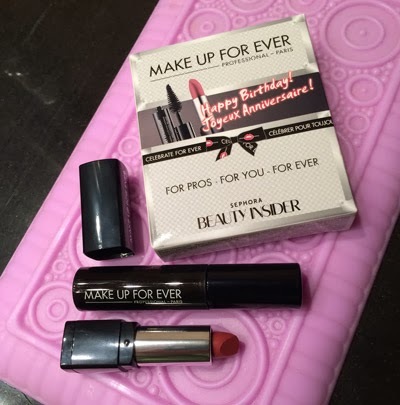 This birthday bonus includes two super small samples from the Make Up For Ever Line: Smoky Extravagant Mascara and Rouge Artist Natural N9 Lipstick, which I had tried and really liked in the past. The mascara is a decent product as well. The brush is pretty tiny so it is hard to compare to a full size, but it coated nicely and lasted throughout the day. Both goodies are pretty nice. And I really liked that Sephora offered a pretty premium product for the gift. They are just so tiny. That's really my only complaint. Sephora will allow you to pick up your gift in-store or during online checkout. Calvin Klein seems to have nailed it with this beauty product. The mascara has a great brush with tiny bristles that caught each last. The formula is thin and makes for great daytime wear, although you will probably want a little more drama for evenings out. 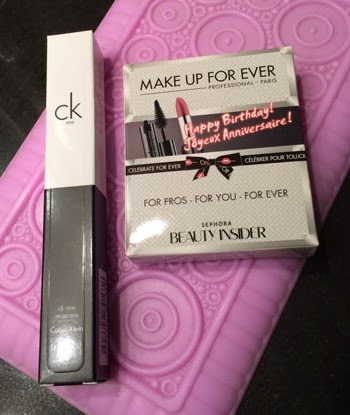 I was a little worried that the mascara would include the CK One signature scent, but thankfully it did not. THE SKINNY: Ulta is the big winner here. You get a full-size and newly-released product that retails for $18. That's pretty hard to beat.